If you're interested in a Gulf Shores / Orange Beach condo rental, we offer many wonderful options both on and off the beach. 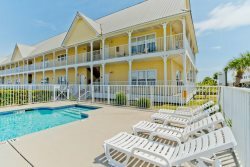 A condo is a perfect choice for your family and friends to stay while enjoying all the wonderful things to do on the Alabama Gulf Coast. Sizes offered are a studio, 1 bedroom, 2 bedrooms, 3 bedrooms 4 bedrooms and 5 bedrooms. Check out the properties below to find the perfect condo rental for your vacation!